One last Sew South post. I just wanted to acknowledge Leah Day for her very inspiring and motivational speech. Leah told us a little bit of how she evolved into a Free Motion Quilter and how not to sell ourselves short. How to find what you do well and then do it the best you know how. And then to keep learning and practicing and getting better and better. She wasn't just talking about FMQ either. I felt like she was speaking directly to me. So much so, that I came home and decided to put a price on my clutch pattern and list it on Craftsy. Leah was so willing to share her business ideas and wants to help others be successful. Thanks, Leah, for motivating me and giving me a bit more confidence. 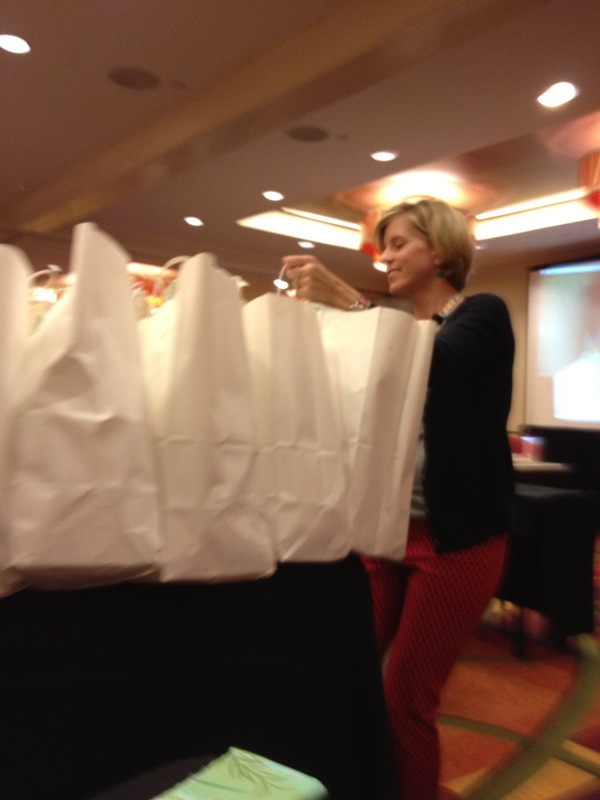 It seems Jennifer was saving some of the best for last, too. On the last day of the retreat, we gathered in the ballroom just to take photos and say goodbye. She asked if anyone wanted to say a few words about what Sew South meant to them. Everyone spoke and there wasn't a dry eye in the room. 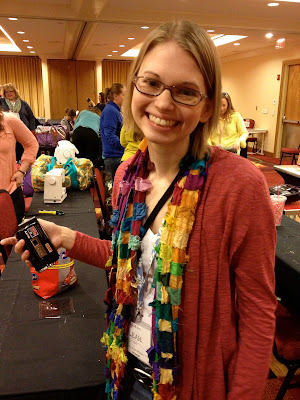 It was more than a sewing conference, even more than a retreat. We became our own little tribe. A few minutes later, Jennifer's husband peeked his head inside the room and said, "it's here"...and just like Oprah, Jennifer wheeled in huge carts full of swag bags and said, "You get a bag, and you get a bag, and you get a bag". 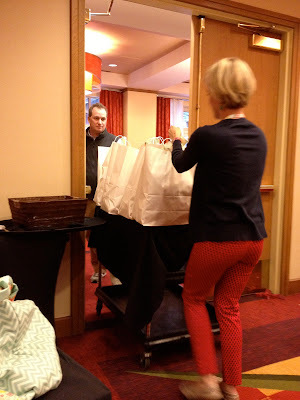 This is my combined loot which includes my purchases, swap gifts, Secret sister gifts and all the swag from the amazing sponsors of Sew South. 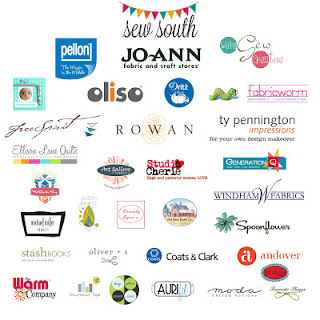 Thanks to all the sponsors and friends of Sew South. Favorite Things, Green Bee and Oliver + S.
Back to the title of this post, "Saving the Best for Last"...you can enter to win some of this swag, too. Hop on over to the Sew South blog and enter to win. Hurry, 3 winners will be chosen on April 10. What an incredible time you had! Isn't it amazing how one person's word can resonate and inspire! Enjoy your swag! Yay, Di, well done on getting your pattern out into the world! The conference sounds awesome on so many levels; the best events always do. Not only did you get your pattern out there, but no 1 too! That's a great haul, a real blinder indeed! What a great sisterly bonding experience! I'm so happy you got your pattern out there and are selling it!!! Great for you for getting your pattern up for sale! I hope you have some success with it!